Do you have a water line that is damaged? There is no reason for you to overturn your perfect lawn to make the repair but instead call Knoxville Plumbing to find out about Trenchless water line installation. At Knoxville Plumbing, you get competitive rates with stress free repairs. It takes plenty of time and effort to get your lawn looking just so and for you, the last thing that you want to have to do to make a repair to a water line is to turn it over. When your water line needs work, either because a tree root has gotten in the way or because your sewer backed up, our plumbers specialize in helping by working on Trenchless water line repair and Trenchless water line replacement. Without our help, you could find your yard in a heap of a mess. When you call Knoxville plumbing, you will find that our Trenchless water line repair experts are equipped with all of the latest and up to date technology that works to make repairs and replace the damaged water line without making a mess of your lawn and garden. To see how Knoxville Plumbing was able to help your local neighbors and residents, click here to see what all our customer reviews had to say about our services. What Is the Benefit of Trenchless Water Line Repair? The Trenchless water line repair and Trenchless water line replacement will cut back on the need to dig up your lawn excessively. We strive to create the most accessible access points that will work to pipe the new line underground without digging up the lawn. Once we find the right points, the lines will be ran and your plumbing will be fixed. To make the process minimized and to avoid excess damage to the yard, the Trenchless water line repair will cut out the worry of needing to call another contractor in to make more repairs either to your yard or to your driveway from making the necessary repair. The Trenchless water line repair method will take about 3 days to complete when compared to the old method that takes up to weeks to repair. Using the old method of making water line repairs, your yard will require excavation methods to make the repair. 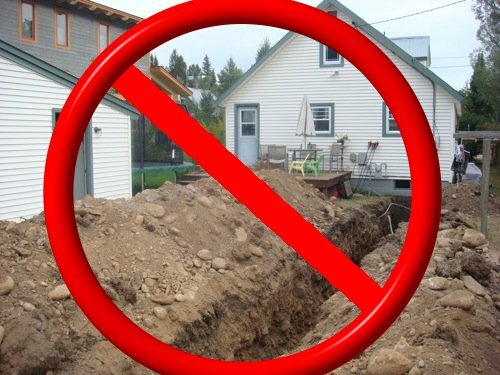 The Trenchless water line installation is instead the method you should use to avoid spending more money when the repair is completed. What is the Cause of Your Water Line Issue? There are a number of things that can cause problems with your water line and cause it to break. In most cases, the water line running to the home can be more than 30 years old. The old materials used on the water lines back then have changed drastically as the older lines were made out of ceramic materials. Even though a ceramic pipe is able to last for years, the forces overtime can cause the material to crack thus needing to be replaced. For starters, the ground is going to shift throughout the years. Imagine that if the sidewalk that you walk on shifts and cracks, why would the ground beneath where your water lines are ran not do the same? Because the ground shifts around the water line, the water lines can be damaged and break. Another factor that goes into damage to pipes is weather. When the water freezes in the pipe, it will cause the pipe to expand and this causes stress on the pipes. Too much force or expansion is bad for the pipe and can cause it to rupture no matter what the pipe is made from. Has your water bill been higher than normal recently? If so, you could have a busted water line and not even know it. Have you noticed flooding recently? This might not be noticeable until it backs up quite a bit. This factor depends on the soil in your yard actually. When water runs through clay and other dense ground materials, the water could simply soak more into the soil instead of pooling on the surface. The more severe water line damage could cause contaminants to enter into the home through the water supply as well as a collection of dirt noticeable underneath the hot water unit. You will also notice that the water pressure in the home is decreased. When you select our company, you will be reassured with a quick response and professional courtesy that our team of experts can give you from the start to the end. At Knoxville Plumbing, we will give you all of the upfront costs associated with the repair so later on there are no surprises. To get quick results, call Knoxville Plumbing for all of your Trenchless water line repair and Trenchless water line replacement and installation needs.